ARCHIVE. The treatment of open wounds is something that we take for granted as a systemized approach to health. Yet, the history of wound care as we know it spans back just 200 years. It was only in the early 1800s that Hungarian physician Ignaz Philipp Semmelweis proposed hand washing as an approach that could prevent infection. Physician Joseph Lister took this insight forward to treat surgical gauze with carbonic acid, which cut his surgical team’s mortality rate by nearly half. Today, the field of wound care is in the midst of a similar kind of transformation based on moisture and pH monitoring. Research in Qatar is making a significant contribution to this next leap forward. Professor Patricia Connolly, of Strathclyde University in Scotland, has already made significant progress in moisture monitoring, with her patented WoundSense technology, currently used in Saudi Arabia, the United States, Scotland and UK (promoted there through the Department of Health). 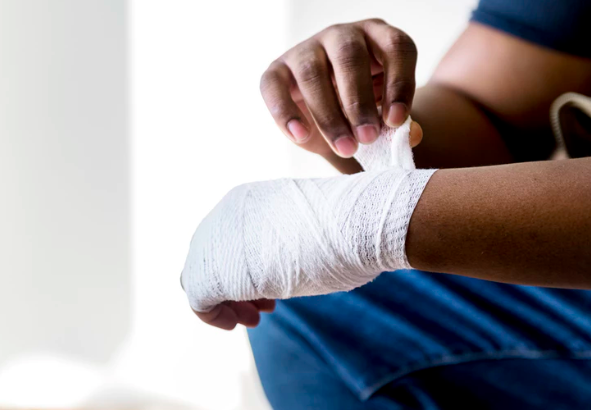 The technology monitors wound moisture without bandage removal, which, if unnecessary, is time and resource intensive as well as risky in terms of exposing wounds to infection—unless moisture levels indicate the need. WoundSense technology relies on electrodes that are in direct contact with the wound fluid. Ink is used as a conductor, so that the nature of the electrical signal along it can be used to indicate the level of moisture—essentially, the ionic (charged particle) movement and the level of resistance (to that movement) along the ink is directly related to the level of moisture in the wound, as is the system’s ability to store an electric charge. Professor Connolly said that there is a correlation between the rate and success of healing and the level of moisture in leg ulcers, which are a focal point of wound management research. This knowledge translates to other types of wounds as well. “We are looking at ways for people to use this system at home so that nurses can visit and focus on other things besides changing dressings,” she said. “This would save nursing time." Given the success of the moisture-detection technology, Professor Connolly has received support to oversee a large-scale study into similar technology based on pH. Funded by a QNRF National Priorities Research Program grant, she has teamed up with Dr. Ihab Seoudi and Dr. Hanadi Al Hamad, Consultant in Geriatric Medicine—both of Hamad Medical Corporation—to conduct a multi-disciplinary study into ways of monitoring pH at the wound site, which would offer insights into how the wound is progressing that have never before been available at early stages. Until now, bacterial growth and wound progress have been based on observations alone. This wisdom has been cultivated over many generations of clinical practice, and yet it still comes up short compared to what pH sensors could offer. “With this technology, we are able to provide a diagnostic profile that’s based on science,” Professor Connolly said. “Before, it was up to the nurses’ observations of debrided, dead tissue as well as the smell and look of a wound. By the time these signals came through, it could be quite far down the infection line. We will now have a lot more experience and parameters and be able to offer a better picture of what is going on with the wound and in turn be able to better manage intervention. Sensors for Advanced Wound Care. ARCHIVE. Compared to studies in the fields of biology and engineering, nonlinear dynamics might not be so obvious in terms of its worth. In reality, it is an area of physics research that permeates the natural world and a field integral to so many others. Dr. Milivoj Belic won the 2012 QNRF Research Team of the Year Award for his prolific contributions in this field, accounting for more than ten percent of Texas A&M at Qatar’s publications. His team’s specific focus is nonlinear optics, wherein they research the behavior of materials and laser light as they interact. In linear optics photons do not “talk to” each other; however, in nonlinear optics they do, through the medium. Understanding the conversations—through the evolving language of nonlinear equations, i.e., nonlinear dynamics—helps researchers understand the material under study. By running lasers through different types of materials such as gases, photo-refractive crystals, and nematic liquid crystals, Dr. Belic and his team observe the entire system as the light propagates, to get an idea of the material's response and the processes at play. The equations describing these processes are linked to waves and light and also with the response of the material—so it is both the response of the material and the behavior of the laser light, together, that are studied. 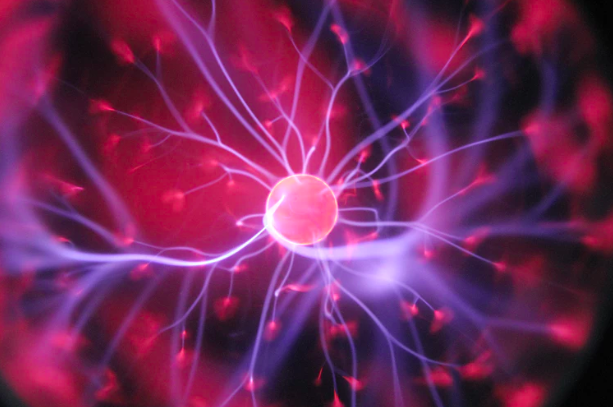 The mathematical language around many physical phenomena is based on differential equations. A classic example would be the Schrödinger equation, which describes how the state of a quantum system changes over time. This is useful in linear systems and quantum mechanics. However, Dr. Belic explained that nonlinear dynamics is even more challenging than quantum mechanics. Specifically, it involves nonlinear Schrödinger equations and relies heavily on computers to crunch numbers because the responses in nonlinear systems are sometimes so erratic, evading analysis through the equations used in more predictable systems. Interestingly, most natural systems and materials require nonlinear thinking. Whereas research in many fields is goal or product oriented, Dr. Belic said his team’s research is often curiosity-driven. A co-evolution of experiment and theory, the research requires a constant striving into the unknown. “We are always trying to understand things, to contribute to a bank of understanding about nature at the basic level,” Dr. Belic explained. “We don’t produce gadgets—we want to know how they work. Here in Qatar, we had to start from scratch, so we started with theory. Some of our experiments are performed in other places such as Australia, the US, Serbia, France and Germany … we have a lot of collaborators. What excites Dr. Belic now is the potential to collaborate with researchers in other fields, enriching findings with the basic knowledge of physics and properties of materials. Establishing homegrown teams that are capable of producing great research requires a long period of cultivation. Qatar Foundation and TAMUQ have chosen this path and have generously supported the creation of high-quality team-oriented research centers. This turns the spotlight toward Qatar Foundation and TAMUQ as well as the whole Middle Eastern region. We greatly appreciate the strong support we have been given by TAMUQ and QNRF, and look forward to a bright future,” Dr. Belic said. Nonlinear Photonics for All-optical Telecommunication and Information Technologies. ARCHIVE. At the European Organization for Nuclear Research, or Conseil Européen pour la Recherche Nucléaire (CERN), physicists and engineers use the world’s largest and most sophisticated scientific instruments to study the simplest forms of matter. This facility most recently drew worldwide attention as the grounds of the recently discovered Higgs boson, a discovery that won the 2013 Nobel Prize in physics. Researchers in Qatar are turning to the Large Hadron Collider facilities at CERN to address needs relevant to the Qatar National Research Strategy, specifically healthcare objectives related to cancer research. In general, the application of radiation to cancer tumors is nothing new. However, to date, the method has involved the detection and use of photons. Now, researchers are working to apply ion-based - positively or negatively charged - beam detectors. The differences are many in terms of how exact the ion-based beams can be when targeting cancer cells in extremely sensitive areas of the body, e.g., brain tumors. 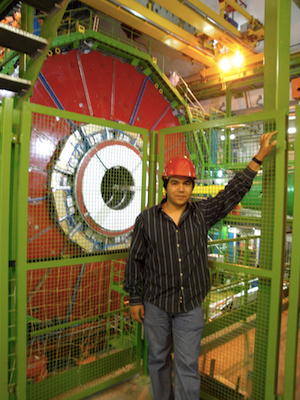 Dr Alfredo Castaneda (Texas A&M University at Qatar) standing in front of the Compact Muon Solenoid (CMS) detector at CERN, where GEM could be installed. Using sophisticated electronics at CERN, the team is detecting particles that give them an indication of the beam location within a few tenths of a micron (a human hair has an average width of 300 microns), he said. So with several detectors on a job, the entire trajectory of an ion particle will be read very precisely. The team has run simulations and is in the process of publishing findings along these lines, within the realm of accelerator physics - “we have intensive simulation that is running, and we are using the super computer at TAMUQ that has been bought by Qatar Foundation. And one simulation can easily take three to four weeks,” Dr Othmane explained. More than two years ago, CERN launched a knowledge transfer initiative called Physics for Health. Dr Othmane recently traveled to Geneva to meet with the Director of Applications at CERN and discuss the possibility of Qatar’s involvement in the program going forward. Through collaborations with CERN, Qatar could also send secondary school teachers to the facility to receive training that would boost their teaching skills. “Of course having Qatar involved in the medical applications can be very important because one of the Qatar National Research Strategy pillars is health. I represented TAMUQ on the national committee for the research strategy, a committee appointed by Her Highness Sheikha Moza, and one of the recommendations of this committee is to work on therapy, specifically, sophisticated medical applications from the physics point of view,” Dr Othmane said. In the end, Dr Othmane said that this research and the work at CERN would not have been possible without the support of QNRF. "Without the NPRP funding, I wouldn’t have been able to travel to CERN on behalf of one of Qatar’s university research programs."